The Largest Historic and educational theme park in the World, this is the Vendée’s number 1 attraction along with the Cinescenie night time show which is held on summer weekends. 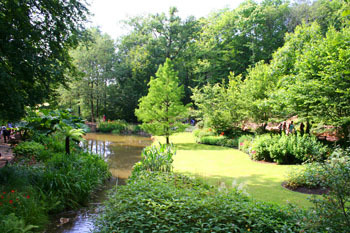 The 110 acre natural woodland site with attractive gardens and lakes has over 1000 animals, 17 restaurants there are 4 villages from different times in history which have been meticulously reconstructed and where many of the day to day trades are re-enacted to as near authentic accuracy as is possible. There are 5 major Spectaculars that take place throughout the day, most are repeated but this depends on the time of year that you visit. There are also dozens of smaller activities happening everywhere you turn all over the park, and wherever you go there is something different going on. It is without doubt the finest day out in the Vendée and something the equal of which you will not find anywhere else in the world. Mousquetaires de Richelieu a show based loosely on the 3 Musketeers and held inside an enormous auditorium with the world’s largest curtain (70m), this show, which involves horses dancing on a lake, ladies dancing through the fountains and of course our 3 Musketeers plus much more. Tip:- Even though this is held in a gigantic theatre, seats are limited so get there 15 minutes before the start time. Gladiateurs. The large Gallo Roman coliseum is the setting for this great spectacular which includes gladiators, "Ben Hur" style chariot racing, the feeding of a few Christians to the lions and a few other pieces of entertainment. It’s a great show in a spectacular setting. Les Orgues de Fou. Held in April,July and August, this is a grand nigh time spectacular on the great lake with fountains, music and a laser light show. le Secret de la Lance. In the 15th Century, Marguerite, a young and intrepid shepherdess, meets the knight Fulgent du Puy-du-Fou, then Jeanne la Lorraine arrives, she has come to unite all the knights in fighting the English. Before Jeanne leaves she offers the shepherdess a lance which lay in the château, this lance has supernatural capabilities and will help them overcome the English. Le Monde Imaginaire de La Fontaine. Enjoy this interactive experience within the extraordinary gardens of Jean de la Fontaine. Animals from the well known fables will surround you, trees will talk to you, Statues will come to life, plus many more surprises as you journey through the garden. July & August; Open every day. 11th to 14th. 19t to 21st.